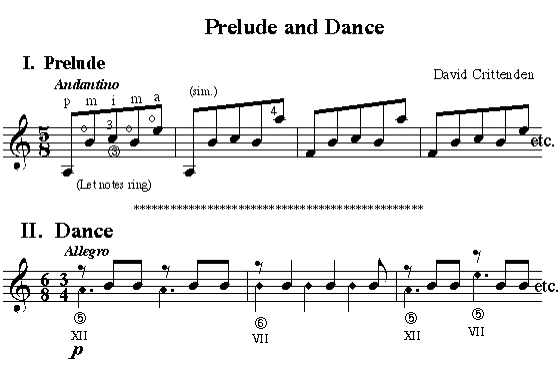 an arrangement for guitar solo (in treble-clef notation) which includes passages with three-voice texture, a freely composed variation on the romanesca bassline, and a passage with artificial harmonics. blank pages to reduce page turns when playing from the bound edition. A new composition in four movements for solo guitar. In DADGAD tuning and written in treble clef and tablature. A programmatic work based on a Medieval Russian poem. This work was commissioned and premiered by Jeff Lambert. aboard the Titanic when it sank in1912. 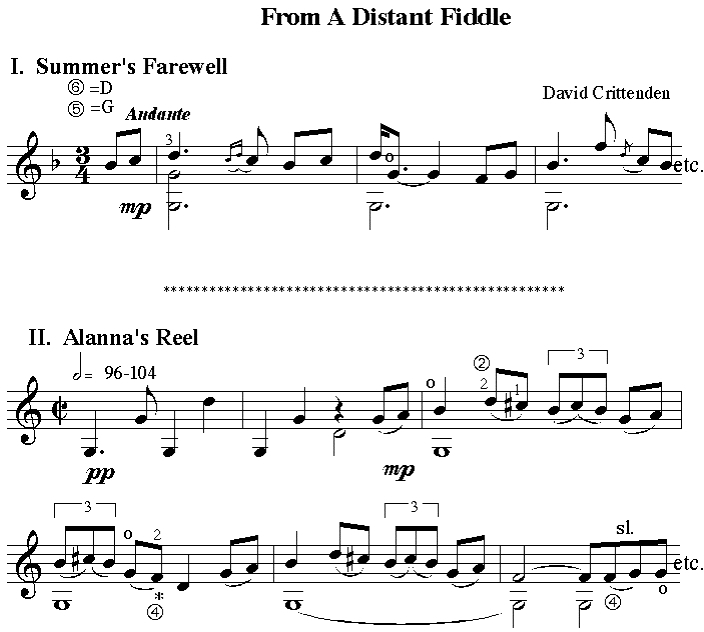 This piece was suggested by Twin Cities guitar enthusiast David Svea who was looking for something slightly off the beaten path of the largely Nineteenth-Century student repertoire that he had been studying. In this piece I sought a middle ground that students and advanced players could enjoy. Bob and Laura Owen commissioned me to compose From A Distant Fiddle for their talented daughter, Alanna, who premiered it in Saint Paul, Minnesota. This piece owes much to an American folk tradition that is rooted in the folk music of Ireland and Scotland. Theodore Front Musical Literature. Inc.
A book of intermediate guitar quartets is published by Alfred Music Publishing. Association of the Americas conference in Minneapolis in 2006.